Fat LossScitec Shredex - 108 kaps. 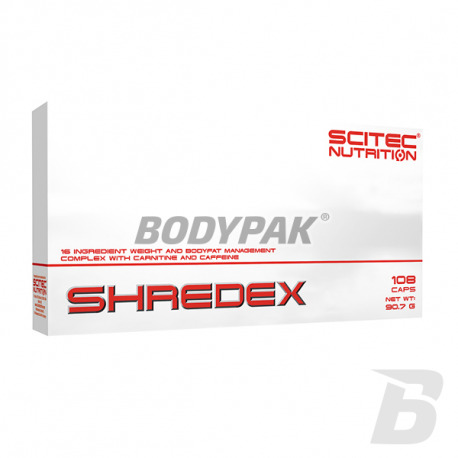 Scitec Shredex - 108 kaps. High-quality preparation, so that up to you speed up your weight loss! Using only safe and effective active substances, in suitable doses. Despite its potency does not cause yo-yo effect! Advanced fat burner on the thought-formula. If you are in the process of reduction and you want to help - it will be a perfect choice! It is a high-quality preparation, so that up to you speed up your weight loss! Using only safe and effective active substances, in suitable doses. Despite its potency does not cause yo-yo effect! 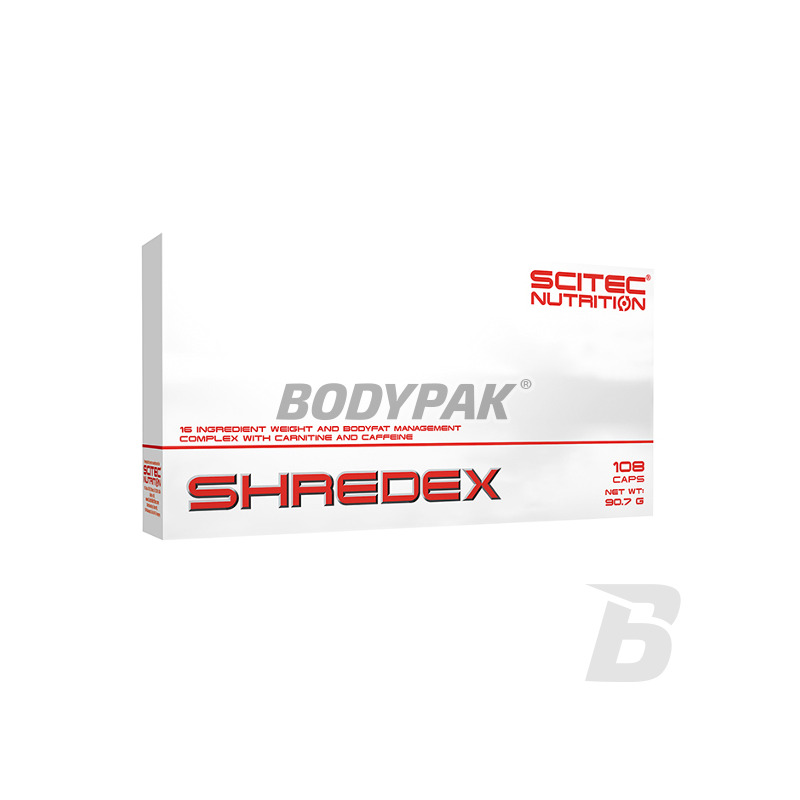 Scitec SHREDEX dietary supplement is a multi-complex supporting and stimulating "regulation" weight loss without Synephrine. 16 is the source of a variety of ingredients such as, among others, L-carnitine, hydroxycitric acid (HCA) [extract of Garcinia Cambogia], epigallocatechin gallate (EGCG) [green tea extract] affecting the control of body weight, body fat and hunger. It is recommended to start applying the product by consuming 1-2 capsules 1-2 times a day to check the tolerance to stimulants. Up consumed 3 capsules once a day. The cycle consumption is 12 weeks, then you should discontinue use for 2 weeks. Avoid other sources of stimulants during use. Ingredients: L-tartrate, L-carnitine, gelatin, bovine, L-phenylalanine, L-tyrosine, kofeinabezwodna extract (fruit) Garcinia cambogia 20: 1 extract (leaf) Camellia sinensis 8: 1 extract (fruit) Momordica charantia 15: 1 extract (root) Taraxacum officinale 16-19: 1, hesperidin extracted from fruits of Citrus aurantium (93%), inositol, Naringinawyekstrahowana fruit Citrus paradisi (93%), quercetin dihydrate wyekstrahowanyz donuts Sophora japonica (84 %), extract (root) Polygonum cuspidatum 8-10: 1, Kwasalfa lipoic Bioperine® - extract (fruit), Piper nigrum 50: 1, pigment (titanium dioxide, red iron oxide, Allura Red AC **) picolinate chromium. ** It can have an effect on activity and attention in children! Ogień! mega fajny produkt.. cena ciut za wysoka jak zwykle, ale jakość to tłumaczy.